امروزه، چندلایه‌های الیاف- فلز کاربردهای زیادی در صنایع هوایی، دریایی و خودرو به دست آورده‌اند. این ساختارها شامل ورق های نازک فلزی اتصال یافته به کامپوزیت پیش‌آغشته می‌باشند. شناسایی و تعمیر ترک‌های داخلی ایجاد شده در چندلایه‌های الیاف- فلز، با روش‌های مرسوم مشکل است. برای غلبه بر این مشکل، در این پژوهش یک سیستم پلیمری خودترمیم شونده بر اساس میکرولوله‌های شیشه‌ای توخالی خردشده معرفی شده است که به بررسی استحکام خمشی چندلایه‌های الیاف- فلز با آرایش آلومینیوم 2024/رزین اپوکسی-الیاف شیشه; نوع E/آلومینیوم 2024، پس از تخریب می‌پردازد. میکرولوله‌های شیشه‌ای پرشده با عوامل ترمیمی (رزین اپوکسی + هاردنر آمینی) به صورت جفت کنار یکدیگر قرار داده شدند و در ادامه در داخل ساختار قرار گرفتند. هدف از این مطالعه دستیابی به کسر حجمی مناسب و همچنین زمان مطلوب جهت رسیدن به حداکثر بازده ترمیم می‌باشد. میکرولوله‌های حاوی عوامل ترمیمی با درصد حجمی‌های متفاوت 5، 8 و 11 درصد در نمونه‌ها به کار گرفته شدند و در ادامه تاثیر آن بر راندمان ترمیم استحکام خمشی پس از گذشت زمان‌های مختلف 3 و 5 روز پس از آسیب اولیه مورد مطالعه قرار گرفت. نتایج نشان داد که بیشترین مقدار بازیابی استحکام خمشی به میزان 89 درصد برای نمونه حاوی 8 درصد حجمی عامل ترمیمی با گذشت مدت زمان 5 روز پس از ایجاد آسیب می‌باشد. Nowadays, fiber-metal laminates (FMLs) have gained many applications in aviation, marine and automotive industries. These structures include thin metallic face sheets bonded to the composite prepregs. Internal damages in FMLs are difficult to detect and repair by conventional methods. To overcome this, in the present study a self-healing polymeric system based on chopped hollow glass tubes has been introduced and employed to recover the flexural strength of Al-2024/E-glass-epoxy/Al-2024 specimens after damage. The micro-tubes were located next to each other in pairs and filled with restorative agents (epoxy resin + amine hardener). The aim of this study was to find a suitable volume fraction and also the optimum time to achieve the maximum healing efficiency. Various volume fractions of filled tubes containing 5, 8 and 11 vol.% healing agent together with different time passing period of 3 and 5 days after primary damage were employed. The results demonstrated that the maximum healing efficiency for flexural strength (89%) was observed for the specimen with 8 vol.% healing agent after passing 5 days from the time of damage creation. Mangun, C.L. Mader, A.C. Sottos, N.R. and White, S.R., “Self-Healing of a High Temperature Cured Epoxy Using Poly (Dimethylsiloxane) Chemistry”, Polymer, Vol. 51, No. 1, pp. 4063-4068, 2010. Zhang, J. Lin, T. Cheung, S.C.P. and Wang C.H., “The Effect of Carbon Nanofibres on Self-healing Epoxy/poly (ɛ-caprolactone) Blends”, Composites Science and Technology, Vol. 72, No. 1, pp. 1952-1959, 2012. Jin, H. Mangun, C.L. Stradley, D.S. Moore, J.S. and Sottos, N.R., “Self-healing Thermoset Using Encapsulated Epoxy-amine Healing Chemistry”, Polymer, Vol. 53, No. 1, pp. 581-587, 2012. Yuan, Y.C. Yin, T. Rong, M..Z. and Zhang, M.Q., “Self-healing Inpolymers and Polymer Composites. Concepts, Realization and Outlook: A Review”, EXPRESS Polymer Letters, Vol. 2, No. 1, pp. 238-250, 2008. Jones, A.R. Blaiszik, B.J. White, S.R. and Sottos N.R., “Full Recovery of Fiber/matrix Interfacial Bond Strength Using a Microencapsulated Solvent-based Healing System”, Composites Science and Technology, Vol. 79, No. 1, pp. 1-7, 2013. Brown, E.N. White, S.R. and Sottos, N.R., “Retardation and Repair of Fatigue Cracks in a Microcapsule Toughened Epoxy Composite-Part II: In Situ Self-healing”, Composites Science and Technology, Vol. 65, No. 1, pp. 2474-2480, 2005. Blaiszik, B.J. Kramer, S.L.B. Olugebefola, S.C. Moore, J.S. Sottos, N.R. and White, S.R., “Self-Healing Polymers and Composites”, Annual Review Materials Research, Vol. 40, No. 1, pp. 179-211, 2010. Prem, B.N. James, K.K., and Rao, K.J., “Self-Healing Of Aircraft Structures By Effective Arrangement of Carbon Nano-Tubes”, International Journal of Engineering Research & Technology (IJERT), Vol. 2, No. 1, 2013. Ghosh, S.K., “Self-healing Material: Fundamentals, Design Strategies, and Applications”, WILEY-VCH Verlag GmbH & Co, 2009. Emami, M. Aram, E. and Mahdavian, A.R., “Smart Polymers: III. Self-Healing Polymers”, Polymerization, Quarterly, Vol. 3, No. 1, pp. 7-38, 2013. 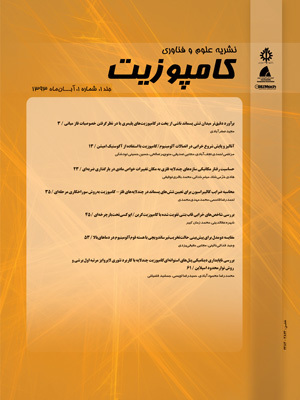 Eslami-Farsani, R. Sari, A. and Khosravi, H., “Mechanical properties of carbon fibers/epoxy composite containing anhydride self-healing material under transverse loading”, In Persian, Journal of Science and Technology of Composites, Vol. 3, No. 3, pp. 285-290, 2016. Rosen, B.W., “Hollow Glass Fiber Reinforced Laminates”, General Electric Missile and Space Division, General Electric Company, Philadelphia, Pa, Vol. 63, No. 1, 1964. Hucker, M.J. and Bond, I.P., “Optimization of Hollow Glass Fibres and Their Composites”, Department of Aerospace Engineering, University of Bristol, 1999. Hucker, M. Bond, I. Bleay, S. and Haq, S., “Experimental Evaluation of Unidirectional Hollow Glass Fibre/epoxy Composites under Compressive Loading”, Composites: Part A, Vol. 34, No. 1, pp. 927–932, 2003. Murphy, E.B. and Wudl, F., “The World of Smart Healable Materials”, Progress in Polymer Science, Vol. 35, No. 1, pp. 223–251, 2010. Bleay, S.M. Loader, C.B. Hawyes, V.J. Humberstone, L. and Curtis, P.T., “A Smart Repair System for Polymer Composites”, Composites: Part A, Vol. 32, No. 1, pp. 1767-1776, 2001. Pang, J.W.C. and Bond, I.P., “A Hollow Fiber Reinforced Polymer Composite Encompassing Self-healing and Enhanced Damage Visibility”, Composites Science and Technology, Vol. 65, No. 1, pp. 1791-1799, 2005. Trask, R.S. and Bond I.P., “Biomimetic Self-healing of Advanced Composite Structures Using Hollow Glass Fibers”, Smart Materials and Structures, Vol. 15, No. 1, pp. 704-710, 2006. Williams, G.J. Bond, I.P. and Trask, R.S., “Compression after Impact Assessment of Self-healing CFRP”, Composites: Part A, Vol. 40, No. 1, pp. 1399–1406, 2009. Tan, W.C.K., “Self-Healing of Epoxy Composite for Aircraft‘s Structural Applications”, Solid State Phenomena, Vol. 136, No. 1, pp. 39-44, 2008. Teoh, S.H. Chia, H.Y. Lee, M.S. Luqman, A.J.N. Nasyitah H.B.S.M. Nurhidaya, S. and Tan W. C. K., “Self-healing Composite for Aircraft’s Structural Application”, International Journal of Modern Physics B, Vol. 24, No. 1, pp. 157-163, 2010. Cortes, P. and Cantwell, W.J., “The Prediction of Tensile Failure in Titanium-based Thermoplastic Fiber–metal Laminates”, Composites Science and Technology, Vol. 66, No. 1, pp, 2306-2316, 2006. Vogelesang, L.B. and Vlot, A. “Development of Fiber Metal Laminates for Advanced Aerospace Structures”, Journal of Materials Processing Technology, Vol. 103, No. 1, pp. 1-5, 2000. Boay, C.G. and Manikandan, P., “Low Velocity Impact Response of Fiber-metal Laminates-A review”, Composite Structures, Vol. 107, No. 1, pp. 363-381, 2014.